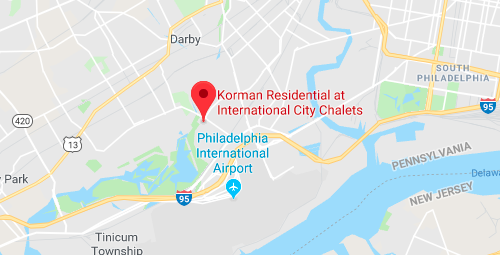 Korman Residential at International City Chalets features Southwest Philadelphia apartments for rent that offer the location, floor plans, and amenities you desire. Our pet-friendly studio, one-bedroom, and two-bedroom apartments are conveniently located near Philadelphia International Airport and minutes from the area's major highways. Our newly renovated, earth friendly and energy efficient Modernista Kitchens are available with stainless steel appliances and maple flooring, and each come with a washer and dryer. Smoke-free apartment homes are available as well. Fitness center with cardio equipment and free weights are just a few blocks away at our sister community Korman Residential at International City Mews & Villas, and a business center with free internet and printing. Korman Residential at International City Chalets in Philadelphia also features our one-of-a-kind Woof Woof Club private off-leash dog park as well as Common Ground Community Garden. Check out a full list of our apartment and community amenities. Read reviews about International City Chalets from our past and present residents and contact us to schedule your personal tour.